I like both of these quotes very much. The first conveys a basic realization about life that needs to dawn by the first Saturn return, so that in terms of personal growth, we can gain real benefit from the unfolding of Saturn’s second cycle. The second quote contains a marvellous image of what the rewards can be during the second Saturn cycle as we grapple with the stern demands of the Saturn archetype. During Saturn’s first cycle, the major task is to find a place to stand in our lives and perceive a few reliable landmarks from which to take bearings, so that we can face life more than retreat from it. Then from 29-30 onward, we can begin to extend and deepen the various possibilities that our lives contain–a process culminating in the second Saturn return at the age of 58-59. After this point of stock-taking, the third and final cycle begins. However, before being able to define clearly what the psychological changes and challenges of the three cycles are, it is necessary to define the essence of what the Saturn archetype brings into our personal lives. I find it beautifully symbolic that the cycle of the progressed Moon runs closely with the Saturn cycle. The progressed Moon talks about our inextricable connection with the rhythms of life — its cycles and its limits. It describes the necessity of separating out and moving on from one period of experience to another if we are to develop texture and complexity. But it also explains our drive to be safe and secure and to keep ourselves on familiar territory. The progressed Sun challenges the latter need, pushing us to differentiate, to take risks, to “follow our bliss”. At the start of life, all is potential. As the Saturn cycles unfold, they describe how that potential gradually crystallizes, concretizes, until by the end there is nothing left to develop in this lifetime. The challenges presented by Saturn have at their core the demand that we become who we are, and who we can be, as fully as possible, by separating from that which we are not and could never be. There are important differences in the developmental demands of the stages symbolized by the three major cycles of Saturn. The first, from birth to ages 29-30, is the thesis stage. It is the most intensely physical, energetic, and least conscious cycle. It is about building the platform on which to stand in life. The second cycle, from 29-30 to 58-59 is the antithesis stage. The initial structure is tested, challenged to grow; awareness and consciousness are more fully developed; life’s goals are pursued and hopefully achieved to a sufficient degree in order to bring at least a tolerable level of satisfaction. In the synthesis stage, culminating at ages 87-88, ideally there is a bringing together and summing up of what one’s life has meant, and a shifting of emphasis from worldly achievement to reflection and spiritual maturing. There is an acceptance of, and preparation for, the inevitable physical decline that ends in the death of the physical body. I find the Saturn archetype profoundly paradoxical. 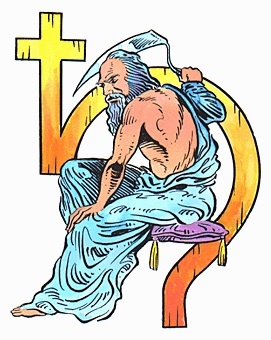 On the one hand, Saturn represents that which nails us to the cross of matter, holding us in the world of form. On the other hand, when Saturn’s challenges have been patiently and honestly worked with, and a mature realism arrived at, the sense of freedom of spirit that can then be released is immense – full of the potential for satisfaction and joy. This sense of freedom is unconfined because it does not relate to matter at all. I am sure this is what the Buddhists mean when they talk about the “diamond soul”. This entry was posted in 05 - New Posts: October 2011 onwards, Astrology Article Archive 5 - The Cycles of Saturn and tagged Astronomy, Cassini–Huygens, Moon, Natal chart, planet, Saturn, Saturn Return, Solar System, Stephen Arroyo, Sun. Bookmark the permalink.